I recently ended up with one odd corn cob from a bag of frozen corn cobs which is rather annoying. I decided to give it to the girls. 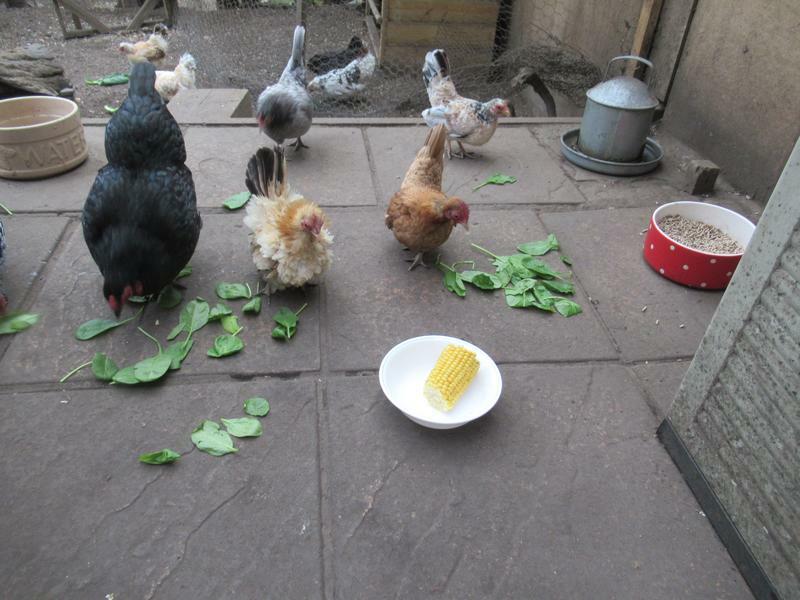 The reason I haven’t given a corn cob for ages is because they always used to get rolled from the patio area into the dirt and then abandoned. I had a light bulb moment and decided to put the corn cob in a dish so that it would stay put. 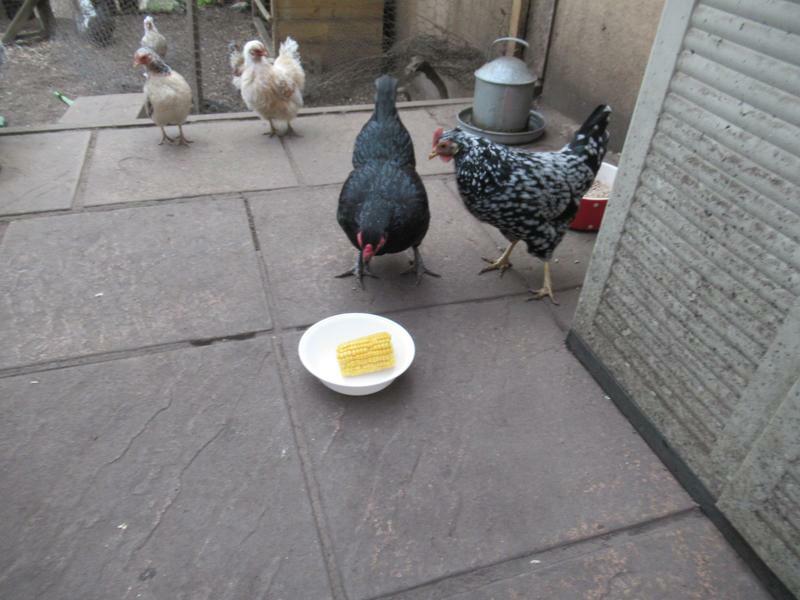 Only Speckles has had corn cob before but the girls associate the white dish with treats and Ebony is always first to any treats. Flame had gone straight to the nest box after the morning sunflower hearts which I expected after moving her from there the evening before. When I returned to check on the girls at lunch time, after my deliveries, I was surprised to see that Flame was still missing. I opened the nest box and Flame puffed up her tail. I realised she was broody at this ridiculously late stage in the year. I went to lift her out and she went to peck at me. I ended up putting on a pair of gardening gloves to lift her out. Ebony and Flame only peck me when they are in the nest box but they peck like they really mean it and have bigger, sturdier, beaks than any of the other girls. 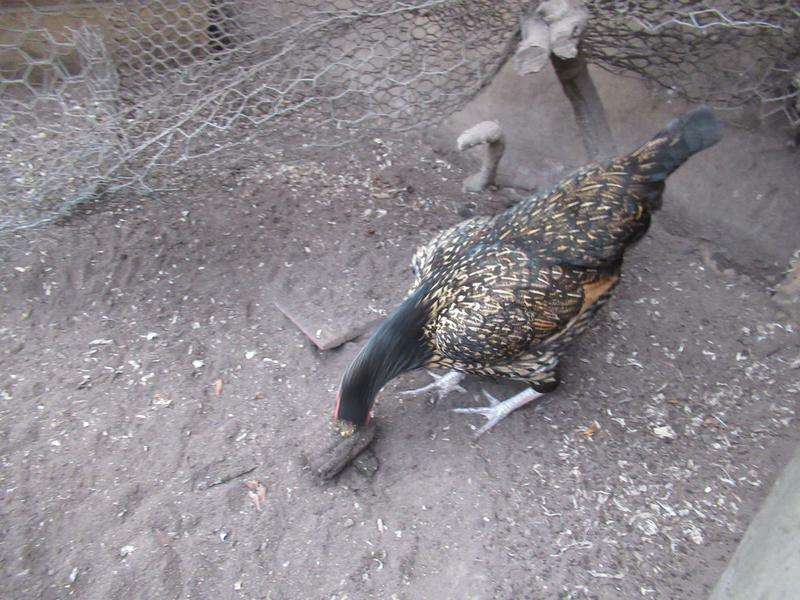 Flame had laid an egg but the broody girls often lay one last egg. I assume she will probably take a break from laying now. 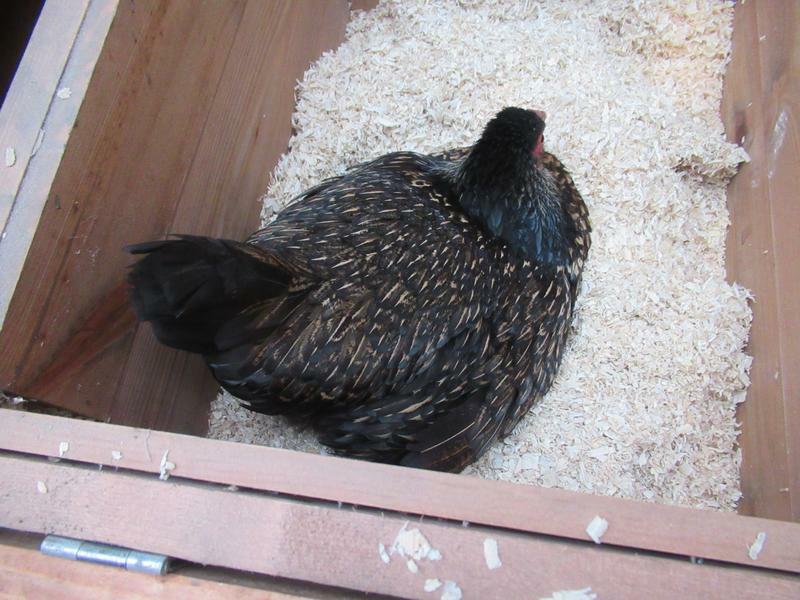 I decided to close all the nest boxes as Ebony had laid her egg in a corner of the chicken shed a couple of days earlier so I felt sure she would do so again if she needed to lay. Meanwhile the corn cob in a dish idea hadn’t worked. The dish was still on the patio but was empty and the corn cob was in the dirt. After I moved Flame from the nest box she sat on the patio for a few moments. She then rushed out into the run shouting angrily and had a mad scratch around in the dirt. She then spotted the corn cob and pecked it with such fury that my photo of her is blurred but it gives the impression of her. Meanwhile Ebony was settling in a corner of the shed. Flame soon stopped shouting and started making her mournful sound. She chased any girls near her and pecked at the apple, had some pellets and walked all round the nest boxes. She jumped on top of the nest box and then she gave up. She returned to the run and seemed to be back to normal. I am hopeful that like Ebony she is smart enough to know that if she can’t get in the nest box and can’t get to an egg then there is no point in sitting. Ebony came out of it in a day so I hope Flame will be the same. I will leave the nest boxes closed tomorrow to make sure she doesn’t go back in. Tonight when I checked on them Flame was perched on the back perch with the usual girls. The amigos however were still having the usual argie bargie. Spangle and Vanilla were perched this time. I moved the other three up to the perch but Marmite ended up next to Smoke. 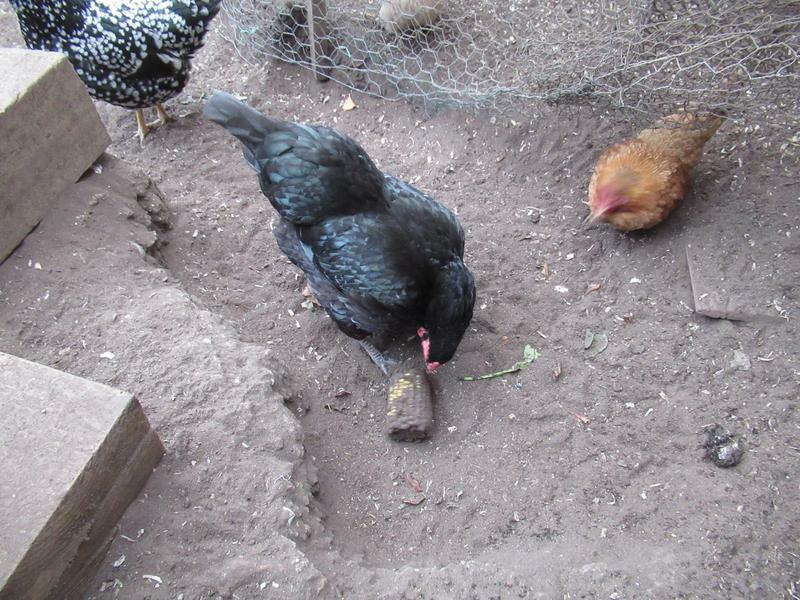 Marmite is so timid that every time Smoke pecked her head she jumped back down again. In the end I moved Marmite to the other side of the perch and they all settled. 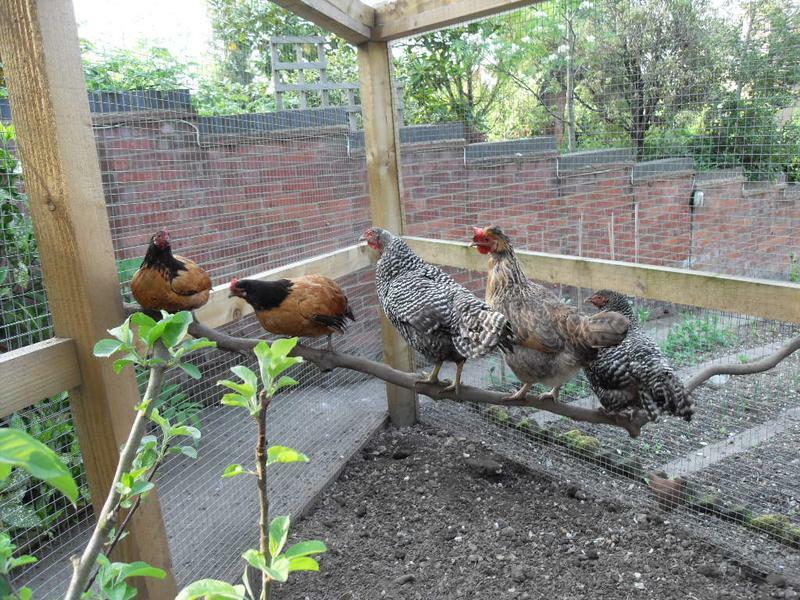 It seems that Smoke will peck any heads perching next to her and Marmite as bottom girl is the most timid. I will make sure I don’t put Marmite next to Smoke in future. What a mission bedtime is at the moment but they all get settled in the end. When you said yesterday that flame was in the nest box at bedtime I thought hmmm… I know what that sounds like to me. Silly girl! Oh, you were ahead of me with Flame in the nest box. I haven’t had so much broody stuff lately so had forgotten how it can go. Never a dull moment. Hanging the corn up, sounds a good idea. Yes, I think it needs to be attached. I used to try putting it in the wire bird food holder but it was a bit of a squash to fit it in. 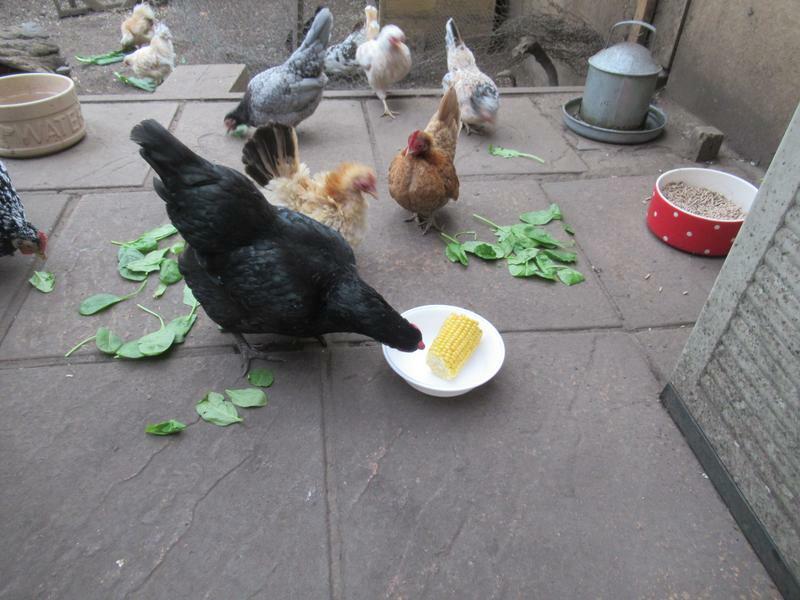 Mine love corn cobs, too, but I always just let them chase them around the run! They strip them absolutely bare. It seems not to matter what the season, some hens go broody whatever, if they’re laying. 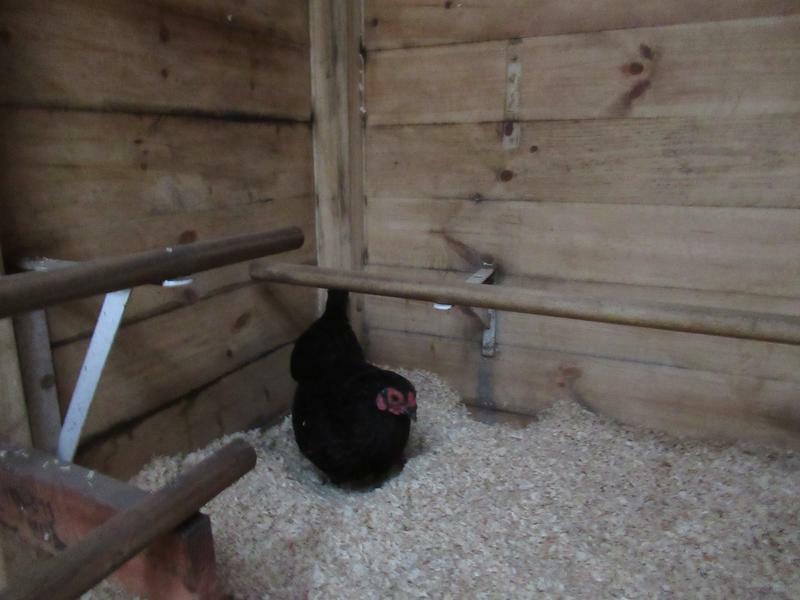 Blackie has gone broody today: shee has been back in lay for less than two weeks and, like Flame, she’s aggressive when I go to move her, really rare in my flock and amongst my silkies in particular. In the past they have chased corn cobs round the run until bare. 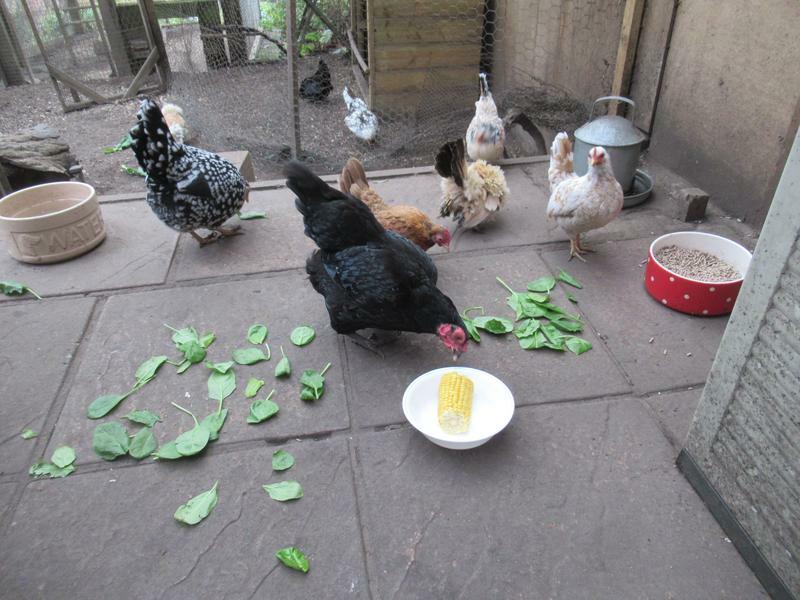 I think the thing was that this time round only speckles had had corn cob before. Ebony and flame had a few goes pecking at it but the rest of the girls didn’t pluck up the courage to try it. I will try again in the summer. I think you are right, if laying, they will go broody at any time. Luckily Flame was quickly over it but has stopped laying for now. Ebony is keeping us going with eggs at the moment but only just.